Challenging the stock image of the 19th century abolitionist as ‘a white man in a black suit’, the actors gave voice to some of the nation’s bravest and most controversial pioneers: escaped slave David Walker, the formidable Maria Stewart and white Southern activist Angelina Grimké among others. The story of Anthony Burns, the escaped slave, who was sent by a Massachusetts judge to return to Virginia and slavery, added a darker tone to the piece. Highlighting the North’s complicity with Southern slavery, Burns’ story reminded the audience that Boston’s history, like the whole country’s, is stained by slavery. Artist director Robert Scanlan introduced the piece by describing the problem the company faced in condensing the historical sources into a dramatic narrative. This difficulty was apparent in its the unstructured nature. Frederick Douglass’ (Vincent Siders) epilogue about William Lloyd Garrison’s (David Gullette) was well placed at the end to bookend this somewhat disjointed piece. Vincent Siders’ rich baritones and Gullette’s fervour, as they passionately read aloud the words of these master orators were the theatrical highlight of the afternoon. The performance would have benefited from more moments like these, when the actors put down the scripts and brought these historical figures to life. Overall The Boston Abolitionists felt more like a very compelling lecture than a piece of theatre. I left feeling informed, but not entertained. This well-researched piece presented the audience with a diverse and personal historical narrative, which clearly resonated with many members of the audience. I hope the company continue to work with the Athenaeum’s material about The Boston Abolitionists. The story the Poet’s Theatre have started to tell an important story. It is a story of hope, of justice and the promise that standing up for what is right, can destroy the ambitions of evil men. Despite being a century old, it is a story that we all need to listen to right now. 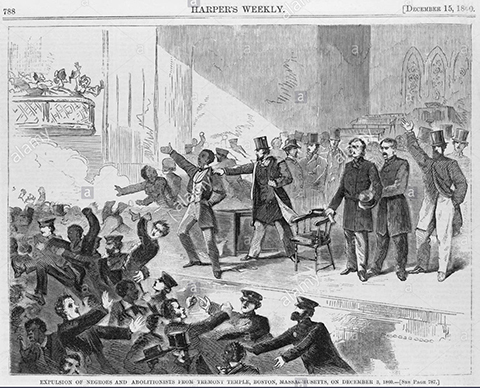 This entry was posted in Drama and tagged 2017, abolition, Angelina Grimké, Anthony Burns, Boston, Boston Abolitionists, David Gullette, Frederick Douglass, historical narrative, MA, March, Maria Stewart, Polly Goss, Robert Scanlan, slavery, The Boston Athenaeum, The Poet's Theatre, Vincent Siders, William Lloyd Garrison by Polly Goss. Bookmark the permalink.